Sojourn Cellars in Sonoma, was started in 2001 by friends Craig Haserot and Erich Bradley who shared a common love of Burgundy. It produces approximately 8,000 cases of wine each year. Today, they source pinot noir, chardonnay and cabernet sauvignon from some of the best vineyards in Sonoma and Napa, including Sangiacomo Vineyard, Rodger Creek Vineyard Gap’s Crown Vineyard and Beckstoffer Vineyard. Of the nine pinot noirs, four chardonnays and four cabernet sauvignons that they produce, the Sonoma Coast pinot noir and the Sonoma Coast chardonnay are the largest volume wines and available in selected restaurants and retail stores. But for the 15 other wines, the production is smaller and the wines are only available direct to the consumer. So how do they reach these customers? Sojourn Cellars has a tasting room/salon in the Sonoma square where the wines are available for tasting, but according to Craig Haserot, they sell the majority of their wine online. So, every spring when they do one of their two releases of the year, Sojourn Cellars takes the salon on the road. 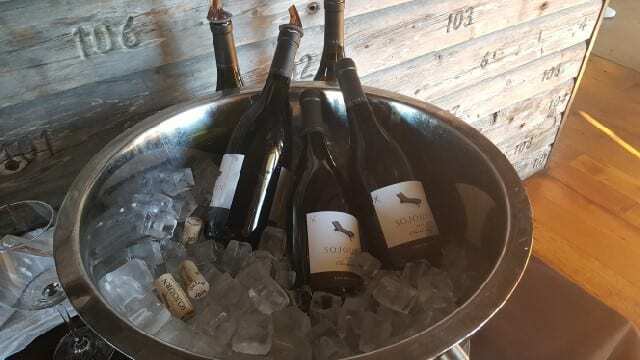 In five cities — Sonoma, Redwood City, Manhattan Beach, San Diego and Chicago — Sojourn Cellars hosts a free event for an invitation-only group of mailing list members. “These events give us an opportunity to say hello and thank you to our customers in person,” Haserot explained. It is also an opportunity for customers who typically purchase online to taste the wines before they make any purchases. The recent spring release featured six wines from the 2015 vintage and two cabernet sauvignons from the 2014 vintage. Sojourn Cellars 2015 Sonoma Coast Chardonnay ($38) – A blend of three cool-climate vineyards, Sangiacomo, Durell and Gap’s Crown, the wine has aromas of citrus, stone fruit, apple and white flowers. A fruit forward wine, it is bright on the palate with crisp acidity and minerality. Sojourn Cellars 2015 Sangiacomo Vineyard Chardonnay, Sonoma Coast ($45)—An elegant wine that balances minerality, acidity and creaminess, it expresses the cool climate Sangiacomo vineyard. The wine has aromas of citrus, pear and lemongrass and a long finish that keeps you wanting more. Sojourn Cellars 2015 Sonoma Coast Pinot Noir ($39) – Like the Sonoma Coast chardonnay, the pinot noir is a blend from different vineyards. The pinot noir comes from Rogers Creek, Sangiacomo and Gap’s Crown vineyards. The aromas of the wine jump out of the glass, with elegant notes of dark cherries and earth. It is a bright wine but soft on the palate. Sojourn Cellars 2015 Rodgers Creek Vineyard Pinot Noir, Sonoma Coast ($48) – Located on a ridge in the Petaluma Gap, Rodgers Creek Vineyard experiences wine, fog and a cool-climate. The wine has aromas of cranberry, cherry, white pepper, earth and mushrooms and is smooth and silky on the palate. Sojourn Cellars 2015 Sangiacomo Vineyard Pinot Noir Sonoma Coast ($59) – Also located in the Petaluma Gap, the Sangiacomo Vineyard enjoys cool ocean breezes and the 2015 vintage was a slow maturation with a long hang time. The resulting wine is lush and creamy with aromas of dark red fruit, black tea, earth and brown spices. Sojourn Cellars 2015 Gap’s Crown Vineyard Pinot Noir, Sonoma Coast ($69) – The plush Gap’s Crown pinot noir has aromatics of dark cherry, dried cranberry, boysenberry and baking spice. Sojourn Cellars 2014 Home Ranch Cuvee Cabernet Sauvignon, Sonoma Valley ($54) – This lush wine with aromas of blueberry and cocoa and fine tannins has a restrained elegance. Sojourn Cellars 2014 Beckstoffer Vineyard Georges III Cabernet Sauvignon, Rutherford ($125) – This is the “big daddy”, a wine that is intensely dark with notes of dark cherry and mocha and big tannins. Don’t worry if you did not make it to one of Sojourn Cellar’s sojourns to their customers.The new release wines are available in the Salon in Sonoma or can be ordered at www.sojourncellars.com. This entry was posted in Lifestyle, Wine and tagged Beckstoffer Vineyard, cabernet sauvignon, Chardonnay, Craig Haserot, Napa Valley Register, Pinot Noir, Sangiacomo Vineyard, Sojourn Cellars, Sonoma, Sonoma Coast, Wine by Allison Levine.